Formerly owned by the Netherlands, Dutch is still spoken in Curacao so, not surprisingly, a large portion of the island's tourism comes from Europe. 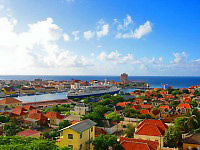 Curacao is located just off the coast of Venezuela. The Curacao tourism board wants to help you uncover its many wonders. There are no "tourist traps" here, they say. Locals and visitors mingle in harmony throughout the island. The currency in Curacao is the florin, or Netherlands Antillean guilder. The dollar, however, circulates freely and is stable. Relax and unwind amidst Curacaoans working, playing, and enjoying life to its fullest - the same as they have done for generations. The people of Curacao love to socialize, so don't be surprised if someone waves and tosses a friendly "Bon Bini!" (Welcome!) or "Kon ta bai?" (How's it going?) your way. People of all ages will love this tour! Get some hands-on experience with sea creatures at the Curacao Sea Aquarium Park! See the animals in action as they display fascinating tricks and games, all for your entertainment. These friendly mammals will have you amazed at their every move. This is definitely a family-friendly tour at its best. After a scenic ride through town, you'll arrive at the Curacao Sea Aquarium Park. 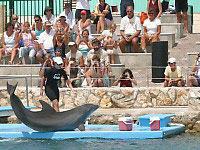 Enjoy the Dolphin Training Demonstration and sea lion show as they show off their tricks and amazing skills. The Sea Aquarium has over 45 species of marine life with plenty of diverse and unique fish. After the flamingos welcome you, the day is all up to you! Don't miss out on the hands on experience with the many sea creatures in the 'touch tank', as this seems to be the children's favorite highlight. Enjoy the special "Sea Aquarium Lunch" at the Blue Ocean restaurant while taking in stunning views of famous Mambo and Sea Aquarium Beaches. 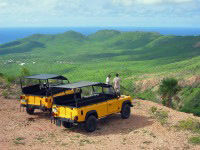 You'll be picked up at your hotel and be given a briefing and safety instructions by your driver/guide in reference to operating open vehicles, specifically in the 'wild Curacao' terrain. After a short scenic tour of the island, you'll arrive at Boca Pistol, located on the northern shore of the park. Here, you'll get the opportunity to witness enormous waves smashing into the rocks, thus producing a loud 'pistol' sound. The Boca Table cave is your next stop, before heading west to explore the bare terrain filled with cacti and lizards. After enjoying lunch (not included in price) at the historic Savonet Plantation, you'll enter the main park. The Christoffel National Park is a combination of beautiful nature and amazing historical sites dating back to the time of the slave trade. You'll visit old slave plantations and off road areas filled with orchids, birds of pray and sometimes even deer. Other highlights of the tour include amazing, panoramic views, some of them more then a 1000 feet (300 meters) above sea level. 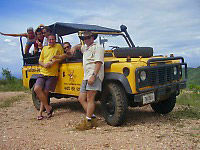 This is a must do adventure when visiting Curacao. Climb aboard for a unique adventure in a bright Yellow Jeep. The 4x4s will take you on tour to places only off road vehicles can reach, in order to spot some of the most amazing scenery and wildlife Curacao has to offer. Don't get left behind - book now. You'll be picked up at your hotel and given a briefing and safety instructions by our driver/guide in reference to operating open vehicles, specifically in the "wild Curacao" terrain. Then, you'll drive to an off road area where your 4x4 outdoor adventure will start. Explore Curacao's wild nature terrain, with cacti and divi-divi trees, with the possibility of spotting wara wara birds of pray, lizards, flamingos and wild pigs. This will certainly be one of the highlights of your holiday. An included visit to the Brua "Voodoo" cave is a interesting historical adventure through time. After, take a refreshing beach break where you'll be given the opportunity to take a nice swim or simply relax. Explore one of Curacao's beautiful beach coves and savor a cool drink and a tasty snack. The Hato Caves are born out of the sea into stunning historic monuments. During this part of the tour, your cave guide will explain to you about the formation process which took place thousands of years ago. During this expedition in the amazing caves, you'll discover the many wonders of nature.